As the weather becomes less oppressive in the state of Florida, more and more people are venturing outdoors to take full advantage of the mild temperatures and cooler air that this time of the year provides. However, human beings are not the only creatures soaking up the sunshine on these cooler days. Lower temperatures force reptiles to be more proactive in regulating their body temperature, resulting in a higher probability of contact and interaction with people. 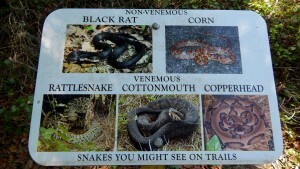 Florida is home to four species of venomous snake: the dusky pygmy rattlesnake, the eastern coral snake, the Florida cottonmouth, and the eastern diamondback rattlesnake. Each one of these snakes, depending of a variety of factors including the body size of the victim and the amount of venom injected, could deliver a potentially life threatening bite. Ideally, bites won’t take place at all. When hiking on trails, walking along bodies of water, or spending time in wooded areas or those near thick foliage, pay special attention to where you are stepping. Snakes have excellent camouflage and tend to remain motionless in the face of danger, making them intentionally difficult to spot. Rattlesnakes emit their tell-tale warning buzz when they have enough time to sense that danger is near, but that is not always the case and a snake caught unaware is a frightened and aggressive animal. In spite of your best efforts, snakes may remain hidden from you. Wearing tall, thick boots is a preventative measure that can help to ensure that if a snake does strike, it will not make direct contact with you and its fangs will not penetrate your skin. – Get the person away from the animal in case it is still feeling defensive and aggressive. Multiple bites are more severe than one! Do not attempt to capture or kill the snake, but do observe its shape and color as emergency staff will want to know what kind of snake it was. – Call for emergency help. – Minimise movement of the victim in order to reduce blood flow and prevent spread of the venom into other areas of the body. If you are in a secluded area, this may be difficult and you may have to leave the person in order to seek help. – Apply a pressure bandage to the bite area and use a sling or splint to prevent movement if the bite is on a limb. – Loosen tight clothing or jewelry to prevent further discomfort if swelling takes place. – Keep the bitten area at heart level or slightly below heart level. Too high and the venom will pour into the body more easily. Too low and swelling will increase. DO NOT apply a tourniquet to the affected limb as this could result in gangrene and amputation. REMEMBER that most snake bites are not fatal. Stay calm and do your best to ensure that the victim does not panic.